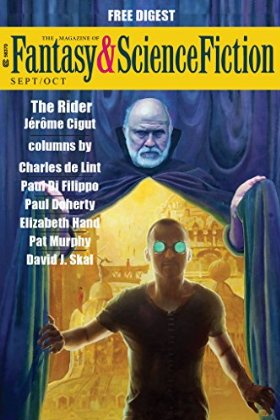 I am very happy to announce that my novelette “The Rider” will appear in The Magazine of Fantasy and Science Fiction (aka F&SF) in September. No, strike that, I am not very happy — I am overjoyed, ecstatic, bouncing all over the place, and still not completely sure this is really happening. It’s a dream come true to be accepted in F&SF. Many, many thanks to Gordon Van Gelder and the F&SF team, and to all the friends who commented on the first few (dozen) drafts. The Rider follows two persons: David, an artificial intelligence embodied in a small, smart phone-like device, and his carrier — his “rider” — Luke, a former, failed poker player who dabbled in cons before switching to this new, not less murky career. David is “the brains” and Luke “the muscles” of this partnership, which until now has been very profitable to both of them. For the backstory, The Rider started on a slight regret — that modern science (in medicine, in physics, in semiconductors…) is becoming so complex that it is now done in large teams of ultra-specialists. The time of the single, genius inventor seems to be slipping behind us — and it’s complicating things for us writers: ideally, for simplicity you’d rather manage only one genius in your story. In Blade Runner, the androids and Deckard all converge to J.F. Sebastian: it’s simpler than introducing dozens of different specialists, and not knowing (without arid theoretical explanations) which one should be particularly protected against the androids. So what if… someone could still design chips alone, in his or her garage? And this is how Hideo Tahara, David’s creator, was born. Plenty of good things, I think. I read the Rider. I liked it. Liked it enough to be sad that there’s not more. Continue the story. Great world building. Nice, intriguing hook & very fast moving & addictive until Black Box disappears. A risky choice for a writer — switching genre after act II. Personally I found the conclusion didn’t wallow in sentimentality but didn’t totally avoid it either. As presented, narrator sounds like he’s got some issues with women beyond wanting to treat them fairly. But then a lot of sci-fi heroes have social maturity/Asperger’s syndrome issues. Hope you’re planning to set more stories in that time/place. I think you are spot on. Thanks for your feedback and words of encouragement! Glad you enjoyed it. Thanks a lot for the feedback!